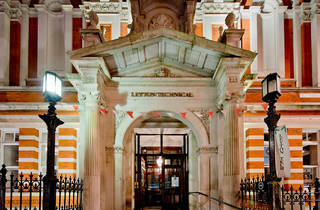 Situated in the Old Town Hall, Leyton Technical originally launched as a pop-up pub during the 2012 London Olympics, but was so popular with the locals that it stayed put. They serve food daily until 10pm (6pm on Sun), have live music every Sunday, monthly comedy and a weekly Wednesday quiz. Really liked this pub, grand building and quirky, retro decorations that I loved. It has lots of different rooms and is a bit of a tardis so would definitely like to go back! Amazing place for everyone at anytime of the year. Great place for calm Sunday family roast (absolutely delicious), perfect birthday organization, fun pub quiz night with mates, or even a place for a glass of wine kind of a chat...And the staff is incredibly friendly too! I really want to give this place more stars as the decor is kitschy, there are lots of comfortable, mismatched couches and chairs about and the place exudes a chill vibe (about 6:30pm Thursday). The dining room area is also quite spacious and the eggshell-blue walls are soothing. The lovely ceiling frieze indicates this must once have been a parlour or hall of some sort. But the bar service, where I ordered, already lends to one negative star. I ordered the veggie burger (sweet potato, kidney beans, mushrooms, hummus) and asked for no cucumber or chips with it and the barman with scraggly black hair made a face of sorts and raised his eyebrow. Seriously? I really don't care what your opinion is of my order; your job is to take it. So per usual, terrible customer service rears its face in London. The burger arrived quickly and whilst presented OK, it tasted good but not great. The burger is held together well with beans jutting out and is a good portion size; the taste of mushrooms is subtle, but it just lacked enough oomph. It's also laughable how the menu notes rocket is on the burger and there were literally two leaves. It's leaves you sated but for £9.50, it's not something I would get again or advise other fellow veggies to get. Also the rest of the menu is boring pub fare; the online (and therefore wrong) menu is much more exciting. Great quiz night and the best chips ever. Fact! This is my local, so I'm more than a bit biased, but I love this place. Pub quiz is a must on Wednesdays - and it's not exactly easy, either. However, the drinks help the losses go down smoothly. Good selection of gins and whiskeys, as well as local beers. Always something different on tap. The food is absolutely incredible, too. I was here the other day and kept seeing beautiful bowls of pasta being brought out and devoured by fellow quizzers, and I decided I had to have it. It was a beef shin pappardelle with parmesan and orange zest - out of this world!!!!! I look forward to coming here for Sunday roast sometime! Great pub, good atmosphere and good beer! 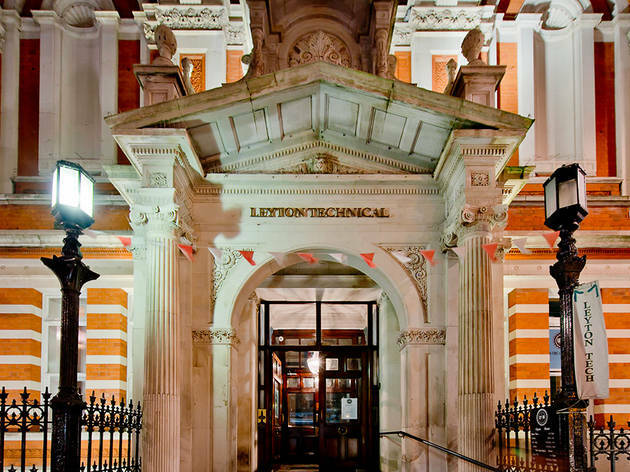 Have visited the Leyton Tech when in the area and always found it a welcoming and vibrant venue serving excellent food alongside a good range of beers and wines. The quirky decor only serves to add to a great experience. I love Leyton Techical. It's my local and I often come in to read the paper after work, settling into one of the armchairs to read the paper with a craft beer or pint of Murphys. I brought my work colleagues here for the annual meal out and it was the first time there were no complaints about the menu/food/service/ambiance - we'll be coming back for all future nights out. I can't speak highly enough of it: the staff, the beer, the playlist, the customers...there's no better pub in London and Leyton is a much better place for having it here. Zone 3 is packed with little gems, and Leyton Tech is certainly one of them! Check it out for comfy armchairs, good music and fabulous food – the duck comfit scotch egg is delicious and you certainly won’t go hungry with one of their Sunday roasts, which are piled high with delicious steamed veg and your choice of chicken, pork, beef, lamb or veggie. There’s even a cracking mid-week pub quiz to keep your housemates on their toes! Great Pub situated in the old town hall, good choice of beer and lovely fresh made food. This pub is the most hipster place you can find in Leyton. Good food and drinks, nice vibe and people too! The sister pub to the Red Lion on Leytonstone High Road it's another Antics pub set in part of Leyton Library. Building is old and feels like an old school building or something, the walk way down to the toliets is quite eery. Great pub though, occationally have a live band on and they run a pub quiz. The sunday roast is pretty good but best to book a table to avoid dissapointment. Love both this pub and the Red Lion, it just depends which end of Leyton/Leytonstone I'm in which I visit.